Posted on April 23 2013, 04:04:58. Last weekend I (oh, and about 9000 other people) participated in NASA's International Space Apps Challenge. My team worked on the Curiosity at Home challenge, split in three parts: translating NASA's SPICE data format to a more readable form, parsing that into commands to the rover, and building a representation of the Curiosity Mars rover itself. The code is available on Github. It still needs some work, but, you know, hackathon. I worked on building the rover, using Lego Mindstorms, and it proved to be trickier than I had anticipated. Most times it would look great, but then refuse to steer or even move at all, as soon as some weight was put onto it. And by weight I mean the NXT brick, which we felt was an indispensable component of the rover. I'm in the process of disassembling the rover and taking photos of it, so that I can then rebuild it and document the build steps. But, in the meantime, a quick recap of how it evolved throughout the (mostly sleepless) weekend. Unfortunately, I don't have pictures of every intermediate version. Yeah, I don't remember exactly which iteration these pictures correspond to. Have I mentioned "sleepless"? Anyway, you'll notice this version is shorter, meaning less strain on the middle section, better distribution of weight and, we hoped, better steering. By then, we had already moved to a motor powering only two wheels, and now we have finally started using two separate motors, one for each rear wheel. Shorter, sturdier, and uses different rotations of the the back wheels for steering, as well as the front wheel gears. I was disappointed with the middle wheels, by this point they were mostly just for show. But the deadline approached, and we had to make decisions. Not too many changes from the previous iteration, mostly some incremental adjustments. This is what we presented, and worked reasonably well (all things considered). Posted on August 1 2010, 02:08:23. If you're testing your code at all (and you are, right? ), it's awfully convenient to automatically have your test suite run whenever something in your project changes. This is particularly handy if you're doing test-driven development (TDD), where you'll be writing a lot of tests and need immediate feedback on them. With Python this is made easy with the help of nose and tdaemon. In a hurry? Jump straight to the summary! (You might not need sudo, depending on your setup). If you google "tdaemon", the first result is a github tree from Bruno Bord, tdaemon's author. The version at Cheeseshop (yes, I'll keep calling it "Cheeseshop", damn it!) lists John Paulett as author and points back to the github repository as its home page. Both versions are almost exactly alike, except that the Cheeseshop one has a slight enhancement (a command-line argument to ignore specific directories). John Paulett took tdaemon, added that feature and packaged it for Cheeseshop. So we'll use his version. So far, if you simply execute tdaemon on a terminal, it'll monitor the current directory and run nosetests whenever it detects a change. Which is fine, but I don't want to switch to the terminal all the time while I'm programming, if I don't have to. So let's arrange our environment so that we get visual alerts every time the tests are run. I assume you already have Growl on your Mac. If you don't, install it, it makes your life easier (if you don't know, it should be at the bottom row on your System Preferences panel). I don't know if there is a notification plugin for KDE. If you do, let me know and I'll add it here! Open a terminal window and cd to the root directory of your project (tdaemon recursively looks at everything down from there). Since you're passing custom arguments to nosetests, tdaemon will ask you to confirm that this is the command you want to run. Simply type "y". Note that, on Linux, nose-notify has a "--no-start-message" option. This is handy, as the start message is mostly useless, and, on Ubuntu, it sticks for a few seconds and delays the actual test results. Now you can create a file called, say, "tests.py", add tests to it and watch what happens as you save it! Posted on October 19 2009, 12:10:41. 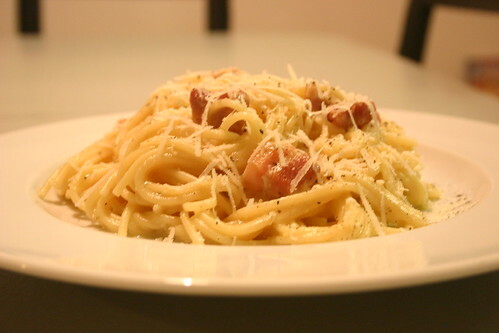 Carbonara is widely known as a simple recipe, but for the longest time it seemed a bit mysterious to me. I'd watch a friend mix a few ingredients together, in what seemed destined to become some sort of spaghetti omelet, only to be presented with a beautiful - and delicious - meal. Then one day I came across David Leite's recipe. It seemed simple enough. Well, it seemed short enough that it'd be simple. So I tried it. I used to make it with bacon, which is ok but sort of overwhelms all other flavours in the dish. I've recently purchased some excellent pancetta and let me tell you, Carbonara just isn't the same without it. Actually, apparently Carbonara is supposed to be made with guanciale, but I haven't managed to lay my hands on some yet (But I will. I will). So use pancetta if you can, but don't let that stop you otherwise. Bacon is fine. Or try both and let me know if you can tell the difference. And do drop a line if you use guanciale! Another small but significant detail: I've found many recipes that use only Pecorino cheese. 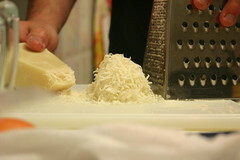 However, David Leite uses a 3-to-1 mix of Parmigiano-Reggiano (or Parmesan) and Pecorino. I usually cook Carbonara with Parmesan (it's more easily available around here), but the Parmesan/Pecorino mix is indeed more flavourful. However, I think using only Pecorino would, again, come out too strong and break the balance. So let's get to it. The quantities are good for 3 people (or two, with repeats; at least that's how it goes around here). It takes about 30 minutes from start to finish, but allow a bit more on your first try. 1 large skillet or frying pan for the pancetta - and afterwards for mixing in the sauce and the spaghetti, so make sure it's big enough! Use a regular pan with the widest possible bottom, if you don't have a large skillet. A little olive oil, just enough for a few splashes on the skillet. I usually don't bother with extra-virgin, as it has a lower smoke point than standard olive oil. Fill the cooking pot with water and put it to boil. Add 1 tablespoon of salt (at any point). 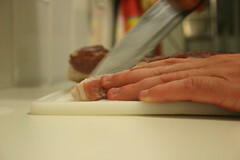 In the meantime, slice the pancetta in cubes. I like them larger, about 1.5 or 2cm on each side, but you can make them smaller if you like. I sometimes cut some of the fat out, but never all of it, since it helps grease the pan (and tastes damn good). Sprinkle a bit of olive oil of the frying pan, heat it on medium high and sautée the pancetta until it's crisp and the clinging fat is golden brown. Take it off the heat and set the pancetta aside, but don't wash that frying pan yet! On a mixing bowl, thoroughly mix two whole eggs, plus two egg yolks. Most recipes call for three eggs plus one yolk, but I found that the higher yolk-to-white ratio helps prevent clumping. Whisk in the 1/2 cup of grated cheese. Add the reserved pancetta as well, and mix everything together. Back to the pot. Once the water is boiling, add the spaghetti and gently stir it to prevent sticking. After a few minutes (but before it's done), pick up 1/2 cup of the cooking water and slowly integrate it with the egg mix. This will also help prevent clumping, especially if your eggs had been kept in the fridge. When the spaghetti is al dente, reserve an additional 1 and 1/2 cup of the cooking water, and drain the pasta. Put the frying pan on low heat and immediately add the spaghetti to it. Fold it once or twice to coat it with the oil that remained from frying the pancetta, and add the egg mix. Now, here comes the crucial part. You want the egg mix to thicken into a creamy sauce, coating the spaghetti. Keep folding the spaghetti and gently stirring the sauce so that it doesn't stick to the bottom of the frying pan. If necessary, add some of the reserved cooking water. I usually end up adding about 1/2 cup (in addition to the 1/2 cup I had already whisked into the egg mix). Take that opportunity to grind some black pepper onto the spaghetti and mix it in. Once you've reached the desired consistency, that's it! Take it off the heat and serve immediately. If you're serving on individual plates, grate some cheese (perhaps some of the Pecorino/Parmesan mix) and grind some more black pepper on the pasta. If you're serving on a bowl, leave the grated cheese and pepper grinder on the table for your guests. And make sure they use them! Finally, although pasta is usually associated with wine, I find that Spaghetti alla Carbonara goes great with beer, especially with lighter ales.